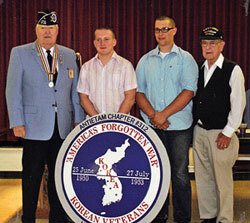 Antietam Chapter 312 of the Korean War Veterans Association is pleased to offer two (2) $1,000 scholarships to graduating seniors of Washington County schools ** in this school year 2018-2019. The attached application form must be submitted, along with all required supporting documentation, by April 1, 2019. All applicants must attend a personal interview with the Scholarship Committee. These interviews will be scheduled for various afternoons during the month of April. Notification of acceptance will be sent to the successful applicants by May 1st. The scholarship awards will be presented at a special meeting of Antietam Chapter 312 on the first Wednesday in June. Parents and siblings of the successful applicants may also attend the presentation. Any questions about the scholarship requirements or its procedures may be addressed to V. Joseph Startari at the above address or by calling 301-739-0274. Remember- your application must be postmarked by April 1, 2019.